What alternative(s) does Europe have? The United States and the European Union used to have common topics to cooperate on and to push forward globally. The international trade order and climate change certainly being two big ones of these. Things have changed over the past year. With the G20 summit in Buenos Aires last week once more displaying US president Trump’s erratic attitude towards trade policy and the current COP24 in Katowice without much hope for the US being a strong ally for climate protection, prospects continue to be uncertain. How much trade is the US doing with the EU? The US handles about one fifth of its exports and imports with the EU. In the EU, the figure is also one-fifth and 14 percent respectively. The two countries are each other’s most important export market. In terms of imports, they rank second only behind China. The EU exports much more to the US than it imports from there. This asymmetry is one of the causes of the current account surplus mentioned. However, Trump’s criticism falls short of the mark, as macroeconomic imbalances bring advantages and disadvantages for all countries involved. Simple “naming and shaming” of the surplus countries therefore does not do justice to the complexity of the situation. Beyond the pure exchange of goods, which is mainly recorded in national statistics, economic relations between countries and regions are nowadays based on a complex network of cross-border value chains. Intermediates, final goods and related services sometimes cross borders and continents several times before reaching the end customer. Traditional trade statistics are not able to adequately map these complex processes. Foreign direct investment (FDI), which is closely linked to the value chains of companies, therefore provides further information on the links between the USA and the EU. FDI are cross-border investments with which companies pursue long-term strategic interests, such as the establishment of a production site. Mercedes-Benz, for example, produces over 300,000 vehicles a year at one of its US sites in Tuscaloosa, Alabama, and employs 3,700 people there. Conversely, Ford completes around 800,000 vehicles per year at its four locations in Germany with a total of 2,500 employees. Here, too, it is clear what role the two regions and their companies play for each other: Well over a third of EU FDI stocks are invested in or come from the USA. For the USA, the two metrics are even well above 50 percent. 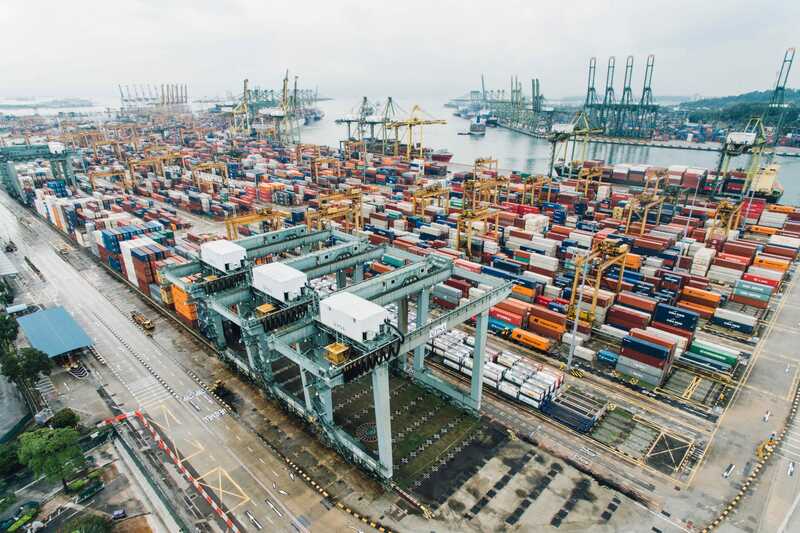 Because of the close economic ties between the US and the EU, the current situation is highly problematic: a possible trade war cannot be ruled out. Our study on the effects of a protectionist US trade policy has made it clear why trade wars have no winners and why the country that starts the war suffers economically in particular. In addition, there is the international dimension: the current way the US deals with its trading partners endangers the rulse-based international economic order that emerged after the Second World War under the leadership of the USA itself and has grown over decades. This order is represented by the World Trade Organization (WTO), which is also subject to fierce criticism from the US President. 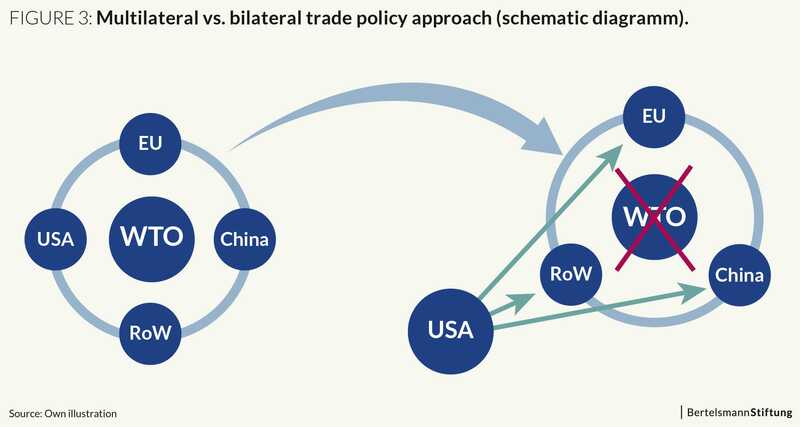 His trade policy approach appears to prefer to WTO multilateralism a system of bilateral relations in which the economic weight of the US could be better exploited in negotiations. EU external relations – which way forward? The EU is in a deep dilemma: the US is its most important economic partner and political ally. It is precisely this partner that is harshly attacking the multilateral world order, whose product is also the EU itself. Transatlantic relations, which have certainly never been free of conflict in the past, are now so severely shaken that it is questionable whether they will regain a comparable quality in a post-Trump era. A reorientation of EU external relations therefore seems necessary. China has already taken a step in this direction and offered the EU an anti-Trump alliance, so that China and the EU may work together against the new common adversary and advocate open markets and free trade. It is not without reason that the EU rejected this proposal: it is not in its interest to get into a sandwich position between its two main economic partners. In addition, there are also sufficient conflict-prone issues in relations with China (e.g. mutual market access) that make it at least difficult to pull together. What are the EU’s options dealing with US-EU Trade relations? – Firstly, it should do more to promote reforms of the WTO and make the US also take over some responsibility for this process based on its partly justified criticism of the WTO. This would give multilateralism a real chance of survival. – Secondly, the EU should at the same time further diversify its external relations and focus less on only one central partner. The EU has already strengthened relations with Japan and Canada, two not to be underestimated economic partners, by concluding comprehensive free trade agreements – a step in the right direction. Australia, India and many countries in Latin America and Africa also have an interest in strengthening relations with the EU. This is where the EU should start. Because – important as these two partners may be for the EU – the world is not just made up of the USA and China. Is the U.S. Dollar a Curse or a Blessing? What Would a Proper European Response to US Punitive Tariffs Look Like?